It takes a clown to take down another. That’s the basis of Tom Arnold’s ambitious “The Hunt for Trump Tapes” coming to Viceland Sept. 18. Arnold seems to know how ridiculous his premise may seem: that the fate of the country is in the hands of the goofy “True Lies” and “Soul Plane” costar. Amid the humor of his various obsessive misfires in trying to track down evidence, Arnold actually uncovers some news, at least in the first couple of episodes made available to critics, where a search for Trump’s many hours on Howard Stern’s radio show turns up a fan who had recorded and transcribed all the shows on his own, catching the president in previously unreported salacious give and take with Stern. Stern wouldn’t release any Trump tapes on his own, Arnold said; he wouldn’t even release the video he had of Arnold on his show talking about the project, so on “The Hunt for the Trump Tapes,” the exchange appears in cartoon form. Such is the result when investigative journalism and politics are on a collision course with entertainment. But we are reminded how entwined those elements have been when Arnold Schwarzenegger is stalked by the comedian for some input. Not just the comedian’s co-star in “True Lies,” he was of course also governor of California for eight years. And Arnold didn’t acquit himself so well at the session, talking non-stop and wild-eyed, calling on reporters but careening right on without hearing their questions in his fractured train of thought. Still, in a week where possibly damning tapes of Trump and his lawyer leaked out; and on a day where his ex-wife Roseanne Barr would appear on Fox News to not exactly apologize for the racist tweet that got TV’s most popular new show canceled, it seemed Arnold was onto something. Arnold says he knew Trump casually over the years. 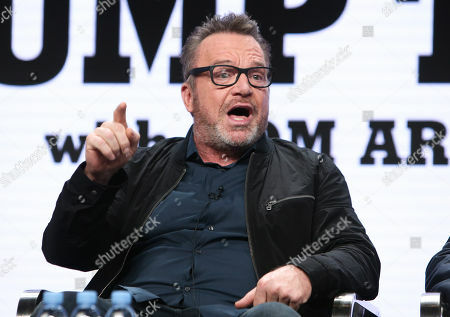 On an episode of “The Hunt for Trump,” he gets a “Celebrity Apprentice” finalist Penn Gillette to talk about racist and sexist things he heard. But as for tapes from “The Apprentice” and its outtakes, they are locked up by its producer Mark Burnett, who wouldn’t release them. Those are some of the tapes he’d like to get his hands on “The Hunt for the Trump Tapes,” but also notorious videotapes said to exist according to a dossier about Trump and Russia. There are also leads to other potentially incriminating tapes, he says. In addition to Schwarzenegger, Judd Apatow, Rosie O’Donnell and journalists like Michael Isikoff, David Korn and Jane Mayer will appear, as will brief White House spokesman Anthony Scaramucci. “I’m going to do this until he resigns,” Arnold vows.